Includes any a la carte items on the menu equivalent in value to the $41 "57th Street Breakfast"
Allowed as room service, subject to payment of delivery charge ($10, as of October 2018); the $50pp allowance cannot be used towards this charge. I know waiting is hard.... I'm sure some reviews will be here soon, especially after the official opening on August 19. I guess not many have booked before that.... and I don't really believe that one glowing review on TA that is already there. My wife and I are here now for a 1 night award stay. Will post more after the stay. Staying this week for one night and then the following week for three nights, two nights are on reward stay with the ADA double bedroom that is suppose to be 800+ sq ft. Will report back later this week. 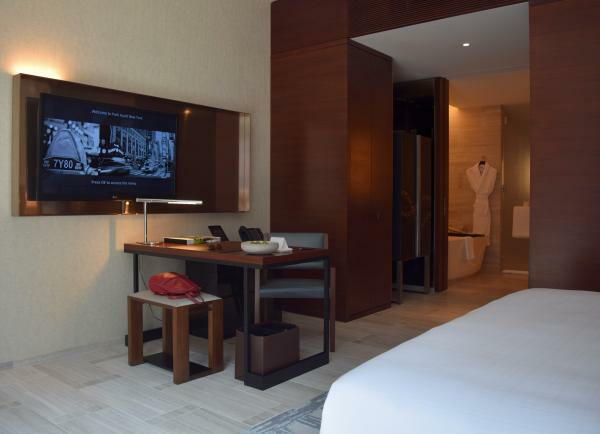 On Saturday August 16th my wife and I had a 1 night award stay at the Park Hyatt New York. The hotel does not officially open until the 19th, so the doormen were only letting registered guests enter the building. A couple of days before arrival the Assistant Guest Relations Manager sent me an email welcoming me as one of their first guests. I was asked what I was looking forward too and assistance was offered. I responded with a couple of questions regarding the availability of the Hotel’s facilities during the soft opening. I also mentioned both my wife and I were celebrating our birthdays which both fall mid-August. I received a same day response with a Happy Birthday and that everything would be open except for the Spa (which opens on the 19th). Front desk noted my status and thanked me for my loyalty. I was informed breakfast was served in the restaurant and it would be complimentary . Found out at breakfast the next morning this meant the $41 “57th Street Breakfast” (choice of egg, breakfast meat, toast, potatoes, bakery basket, hot beverage and fresh juice). Was told I could NOT apply that amount towards other breakfast menu items. For a 1 night stay no big deal, but for a multi night stay this would become annoying fast. I was asked if I wanted the points or an amenity. After asking, I was told the amenity varies from week to week and is a special treat whipped up by the main kitchen. They have both a savory and a sweet option. Another staff member checked to find out what it was and informed me the savory dish was a lobster salad. The desert was a berry tart. Since it was my birthday, they said I could have both food items with their compliments. It was suggested I could have the Lobster salad now if I wished, and the tart later in the evening when we returned to our room. No mention made of any wine or other beverage as a choice. Room upgrade. I was upgraded from “king” to “deluxe king”. Once the doorman knew we were guests, we were ushered inside and another young lady escorted us over to the elevator and explained that the hotel lobby, bar and restaurant are on the third floor. She held the doors and pushed the button for the 3rd floor Lobby. On exit, the bar/lounge is in front of you with 57th street to your right. You need to make a U turn as registration is behind the elevators. The agent was waiting for us and proceeded to check us in. We were there at noon and our room was ready. Lots of pleasantries, welcomes, etc. After explaining the diamond benefits, she escorted us up another set of elevators to our 57th street facing deluxe room on the 18th floor. There is a nice living room like retreat between reception and the entry elevators. Newspapers, and an iced beverage of some kind were on offer. New and spotless. Surprisingly good fit and finish. I did not get my magnifying glass out, but everything worked, fit, opened and closed properly. The room was a basic rectangle, but layout a bit unusual. Long entry hallway on left side of room without bathroom entry door or closets (or anything else) for a good 15 ft. Greeting you at the end of this hallway is a valet station designed as a large steamer trunk on its end that opens up with padded drawer trays, safe, shoe & laundry bags, lint roller, and shopping bag. Tray on top for keys and whatnot. Small light sculpture suspended over it. At this point you turn right and continue into your room. You are now facing the attractive minibar cabinet on the opposite wall. Continue in and there is a closet on your left. Another step and you see the bedroom to your left and the bathroom to the right. Pivot 90 degree to the right and you are now looking straight into the bathroom with 57th street behind you. Large presentation bathtub on the left wall, double vanity on the right wall (other side of entry hall wall). This is a large open space with at least 8 ft. between tub and vanity. Very open to room, but two sliding doors can completely close off the bathroom providing great flexibility. Spacious all marble toilet room right back, spacious all marble shower to the left back. Both with heavy glass etched doors. Pivot 180, mini bar to right with another closet next to it. Bedroom is straight ahead. The hallways, closets and bathroom probably take up more than half the rooms total space... so, on first entry, the bedroom seems a bit small in comparison. Stick this same bedroom in the Hyatt Times square and it would seem gigantic. 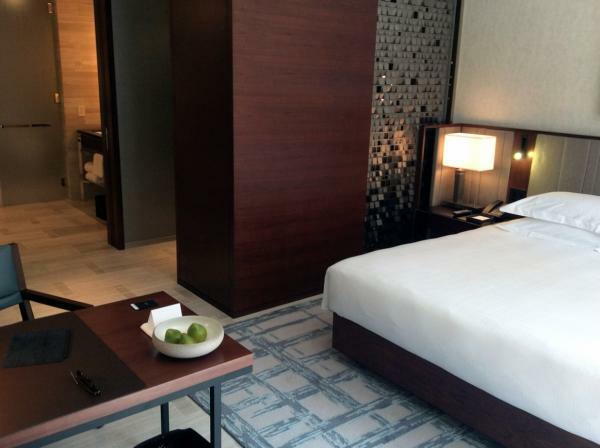 All of the photos on Hyatt.com show what must be junior suites as there is no glass divider or couch in the room. They need to fix this and show correct room photos for regular and deluxe rooms. Colors are muted… all tan and brown, so a bit on the dull side… but everything is of high quality with that Park Hyatt residential feel. Ones first entry to the bedroom may be a bit of a let down, but after staying for a while it stars to grow on you. In other words restrained, relaxing. There are floor to ceiling windows with a 2’ by 3’ structural column in the right corner of the room that kind of annoyed me. It left a dead space in that corner of the room that in my mind was pronounced. Enough so that I almost asked to see another room. View out to 57th St. not a selling point, but at the 18th floor you look down on The Russian Tea room, Carnegie Hall and you are above a few roof lines with iconic NYC water towers with a few other tall buildings in the higher distance... so not a terrible view either. There are Floor to ceiling drapes with vertical sheers… both motorized. Sheers were very attractive. There was lighting up in the drape well which cast a nice glow to the room for the evening. King bed on same side of room as entry door, but due to unusual L shaped entry previously described, you can not see it. There is a metallic sculptural wall art/thing separating the bed from the steamer trunk entry valet. Marble floor in bedroom with area rug under/around bed. One art piece over the bed (brown), plain walls for the most part. Closets and bedroom wall on entry side are dark walnut like wood. There is a nice desk with desk lamp, chair and a stool on "guest side" of desk. Only one "comfy" chair in the room, but desk chair is more of a piece of furniture than an "office chair", so it can be used too. iPad mini with hotel functions, room service, newspapers, etc. on it (sorry, but I like old-fashioned book with printed menus, etc.). Phone with outstanding voice quality. I called “guest Services” and when the person answered the phone the voice was so clear I could have sworn he was standing next to me. Nice bed, a bit on the firm side. Real light bulbs in bedside lights and floor lamp (dimmable too). TV mounted on the wall within a larger metallic display thing. Near Japanese hotel levels of bathroom amenities. Dental kit, nail file, mouthwash, hairbrush, et. All in boxes in neatly arranged display. My wife and I both liked the Le Labo “Tubereuse 40” bathroom amenities. Bones: Great. Very quiet room. AC vent integrated into wood paneling, very quiet… thought I was in a Japanese luxury hotel it was so quiet. Could not hear any other guests (but there might not have been any either). Street nose from 57th street was muted. Definitely there, but pretty quiet. Everything in the room had a solid high quality feel. The shower was one of the very best I have had. Spacious with a ceiling mounted rainfall shower with light in the center. Torrential water output. Wonder if they forgot to install a flow restrictor. If all the rooms have this water volume… get to the hotel before they see their first water bill! The wall mounted hand shower also could be used at the same time. My wife thought the bath was very nice. Salt provided as well as an interesting little scrub brush thing. Tub was rather slow to fill. This is where the Spa, pool, "Jacuzzi", lockers and gym are. I did take a dip and steam. Very nice. Steam room was great with very tall ceiling and a shower in the steam room. Large Jacuzzi with area you can lay in and get bubbled. 3 story space above 4 ½ foot deep pool with large window wall. Not an Iconic city view, but still nice. Pool temp perfect (a little cool on entry, but comfortable once in). There is an array of loungers around the pool set up with towels. On entry an attendant asked if I would like a bottle of water. I had it almost to myself. Locker room was nice with full array of hair care, toothbrush, shavers, etc. Robe and slippers in locker. Although not open for appointments, the Spa was staffed to show guests around. The seating area/ lounge area was a real WOW!!!! It did have a fantastic view out towards the Time Warner building, with distant view to the Hudson and a little of Central Park around the Columbus circle area. Although not the iconic central park view, it was a broad panorama with great composition and layering of buildings (in many ways more interesting than a big rectangle of green). This means that there are likely a few rooms (probably only suites) in the top floors that do have a good view. The pleasant front spa receptionist gave my wife and me a tour of the couple’s suite. WOW!!!! Very spacious with tall ceilings, mostly white with lots of detail… huge tub for 2 carved out of one block of marble, massive shower room behind that. Private lounge in front of it with external view. As previously mentioned the Diamond policy is not very good here… at least for now. All other Park Hyatt’s I can think of have more of a “whatever you want” attitude in this area. The good news is breakfast is very good. The main dining room is an inviting space with very tall ceilings. Lots of marble and wood. Our waiter was very professional and smartly attired. He recommended we try the fresh orange, carrot, ginger juice. It came quickly and was delicious. I ordered the eggs benedict as my egg/meat/toast. Not sure if that was strictly in their diamond policy, or if they let things slide a bit. Anyway, they were perfectly prepared. The emphasis here was in the smoky Canadian bacon/ham flavor rather than Hollandaise sauce. I have met very view breakfast potatoes that rise above mearly edible. The PHNY breakfast potatoes were delicious, the best I can recall having. The breakfast pastries included a croissant, pain au chocolat and a custard danish. All were very good, light… flakey buttery. Coffee was also excellent. Waiter kept coming over to pour it for my wife, checking to see if she would like a fresh pot, etc. Of course they are not fully open yet, and there were not that many people in the restaurant (9:00a.m. Sunday morning), but service was very attentive. While we were dining a manager came over to introduce herself and suggested we come back and try the restaurant for dinner on our next visit. Amenity: As soon as we got to the room I called down to have the lobster salad delivered. It took longer than they said… so I called down to cancel it until evening as we had to go someplace. When we finally got it (second time was prompt) it was very good. A claw and small tail… probably 3 or 4 ounces of lobster with two kinds of dressing. Very tasty. The blueberry tart was long and narrow. Just 4 small bites. But also very tasty. However, we only recieved one set of cutlery. Their whole approach to the amenity seems more suited to a single traveler. Sharing a bottle of wine and a cheese plate makes sense, but a lobster salad and desert… hmmm, less so. We are from NJ, only about an hour away from NYC so this probably colors my perspective a bit. I have not stayed in any of the other top NYC luxury properties (St Regis would be only possible exception) so can not compare the PHNY with them. If I am going to spend $1,000 on a hotel, it is not going to be in a city were I can just drive home and spend $0. I have stayed in all of the other Hyatt/Andaz properties in NYC except for the HP. For an award, spending 25,000 at the others or 30,000 at the PHNY… well… no contest. PHNY is the winner. Paid stay… well, high end luxury hotel guests look for service above all else, so that will either make or break this property (or at least their ability to pull in top $). I am a pretty low maintenance hotel guest, so probably not the best source on this front, but everyone I met during this brief pre-opening stay were very helpful and eager to please. If they mature from eager to please, to just simply pleasing… this will be a hotel on the short list. Considering they are not even officially open yet it was a very trouble-free stay. No functional issues with the room whatsoever. Actual photo of our room. I think they should move the desk a few feet to the left. The PHNY is pricing itself in line with the handful of the most elite properties in Manhattan. I will be curious to see how it works out attempting to go toe to toe against the Peninsula, St. Regis, Four Seasons, MO et al. I am inclined to think that their ultimate average rate is going to be beneath those hotels once they hit full occupancy and so I if I were to make a projection, I think the avg rate for an entry level room will be closer to $750-700/night than the grand a night it currently seems to be (other then the dead spots on the calendar). 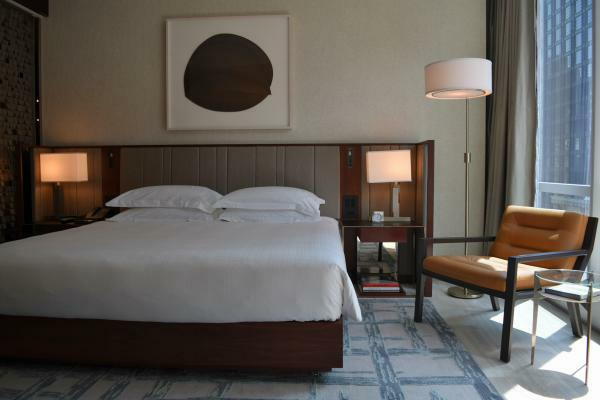 One thing's for sure: The hardware seems to be best of all NYC luxury hotels, a notch above MO and definitely better than the Four Seasons, which needs a renovation ASAP. Now let's see if PHNY has the service to match! I wonder when they will stop playing games with award availability. From what we've been told, there aren't that many standard rooms anyway so I don't understand not allowing award reservations for all of 2015. I want to plan an award stay for next August and HGP said there is no availability for any dates. I then saw the previous thread where the hotel stopped accepting award reservations for 2015. Thanks for the report schriste! Looks like Sebastien Archambault from Blue Duck Tavern is now Executive Chef at PHNY. One and the same. Hope he will have the same success, but much stiffer competition. Looking forward to trying this property in Nov. and reporting here! Thanks schriste! AP rate for end Aug has now dropped to $573~ per night... Good deal? Relatively? Don't feel too bad. They way it's looking it might be a really long time before you could have used them here anyway. Even at $750/night will it be able to make up for its less desirable location compared to MO, Plaza, RC, FS? I know it's only a matter of a block or two, but to people paying these prices, everything matters. Even at $750/night will it be able to make up for it's less desirable location compared to MO, Plaza, RC, FS? I know it's only a matter of a block or two, but to people paying these prices, everything matter. That's a good point I didn't really think about and I think it will certainly be interesting to see what the rate ranges end up being once it normalizes. My gut instinct is that it will be able to command some gaudy prices during the busy seasons, but it will have a much higher level of price sensitivity (price elasticity) then its competitors during the dead periods of demand.